Student Matthew Zuniga prepares a vegan Caesar on ice. This out-of-the-bowl take turns the classic salad into mini tacos, earns best presentation award in annual culinary contest. Last year, a long-running Houston culinary tradition was canceled due to Hurricane Harvey. But this year, the city’s chefs came back strong for the 34th Annual Caesar Salad Competition at the Hilton University of Houston. Competitors included teams from 16 local restaurant and hotels, along with the University of Houston Dining Services, who won the award for best presentation. Participants “brought a new meaning to the word salad,” noted local food critic Carlos Brandon, who served as a judge at the contest, referring to the highly conceptual offerings, such as a Caesar that featured fried oyster with candied maple bacon served in a mini cast-iron skillet by San Luis Resort and Spa (the winner of this year’s consumers’ choice award). The award for best classic preparation went to El Meson, a local Cuban food and Spanish tapas spot. “A garlic-forward dressing with hints of lemon and just the right amount of anchovy flavor” is how Brandon described the winning salad. 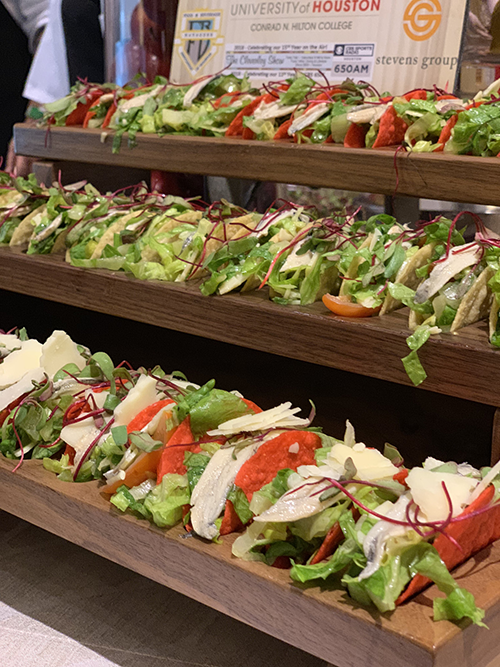 University of Houston Hotel & Restaurant Management student Matthew Zuniga, Executive Chef Mandy Garrison and Senior Executive Chef Alex Brugger took Caesar salad and taco-fied it. Taking the classic Caesar, which contains eggs and fish traditionally, and making it vegan earned the team from Le Bistro at the Culinary Institute Lenotre the award for most creative take on a Caesar salad. The culinary school used vegan cheese and created an egg-free dressing. 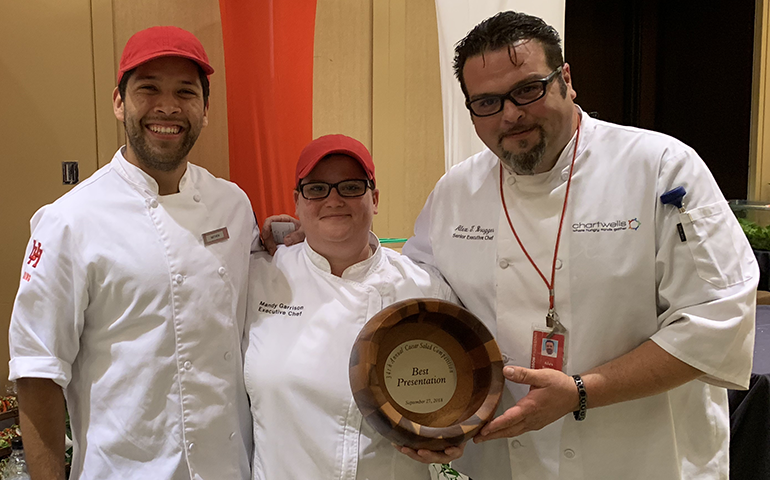 And the wild-card winners at the competition turned out to be the team from the University of Houston: Executive Chef Mandy Garrison, Senior Executive Chef Alex Brugger and Hotel & Restaurant Management student Matthew Zuniga. The team developed a dressing that stood apart from the crowd because of its unique heat. The dressing contains elements of the classic—anchovies, lemon juice, etc.—but smoked, roasted and seeded Hatch chilies make the difference here. Earthy, smoky and slightly sweet as they mature, Hatch chilies are similar to the more common Anaheim pepper, but they’re specific to the Hatch Valley in southern New Mexico. From there, the University of Houston team dressed the salad and placed it in bright red mini taco shells, which stole the spotlight during the judging.